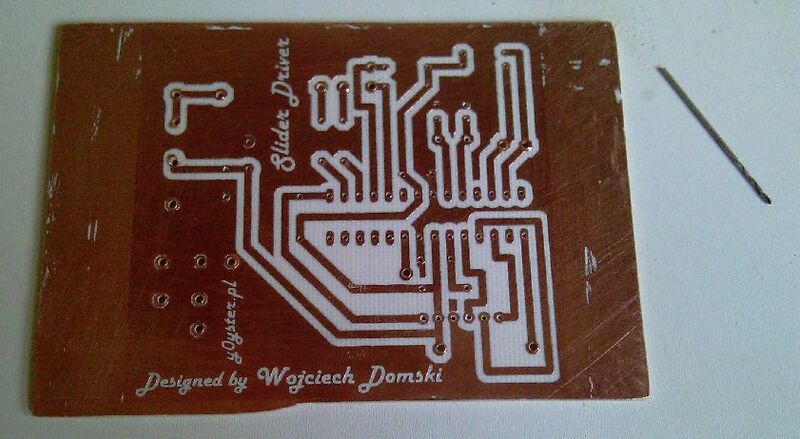 Before we start to make the PCB we have to prepare the laminate. In this purpose we cut a part of the tile. After that we proceed to the cleaning stage. 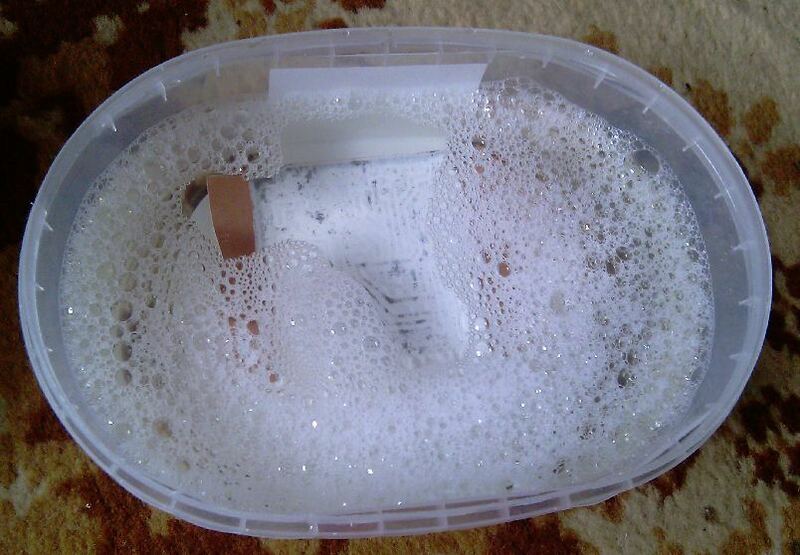 It is the best to use the dish washing liquid and steel wool (a sponge made of metal wires). If we make an effort to make it good it will pay off in future. The purpose of those actions is to remove all stains and degrease the surface. If we don’t do these properly further steps won’t succeed. After removing all stains we wash the piece of the laminate under running water. To degrease the board we can use nail varnish remover, bleach or alcohol etc. We put some bleach on cloth then we wipe the board (copper side). 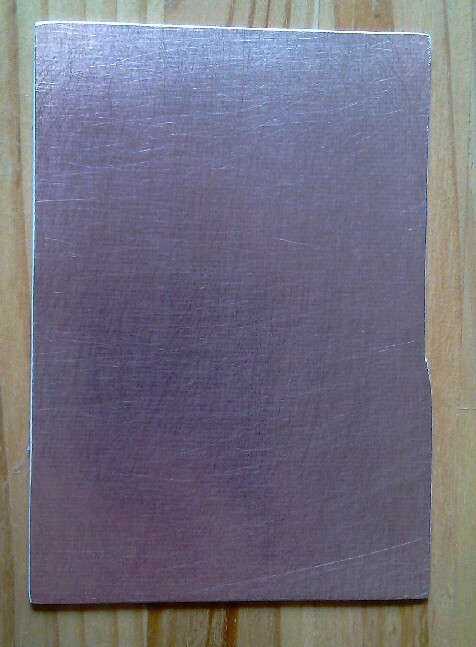 If the cloth was white now it is covered with copper which makes it look dirty. Remember to not to touch the copper side with your fingers! If the DPI resolution isn’t remained our printout is badly scaled. 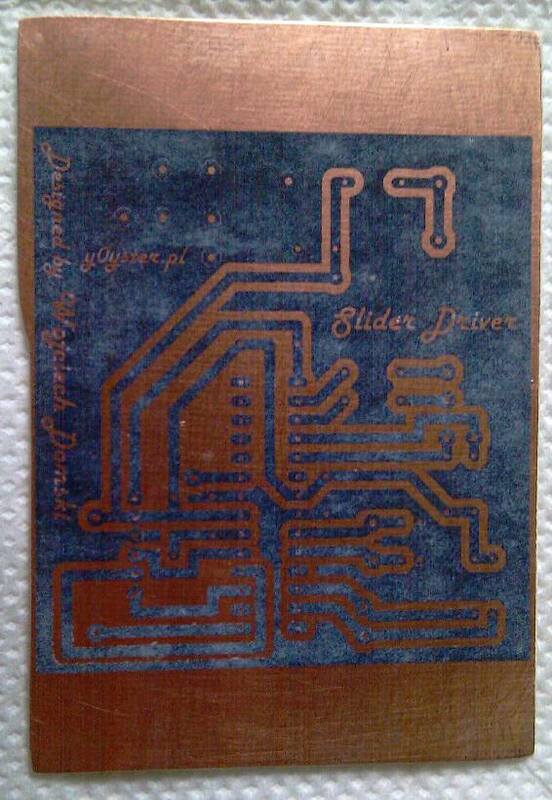 After putting elements on the board especially digital ones on dies they won’t fit to the board. It is very important to use the chalk overlay paper. It is smooth in touch and it has got features which make it a irreplaceable companion. The laser printer transfers the toner from the cylinder on to the sheet of paper. If we use a sheet of a normal paper we won’t be able to extract the toner out of the paper. Secondly, if we use an ink printer the ink will sunk into the structure of the paper. In the effect it won’t be possible to transfer it on the board. 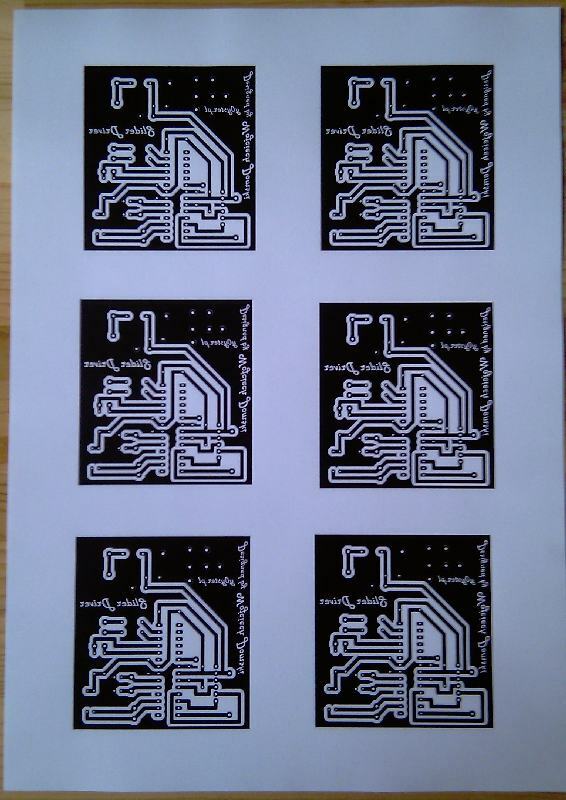 As always there is a solution for those ones who don’t own a laser printer. The most of photo copy centres have professional equipment which allows them to print on the chalk overlay paper. At this moment we choose the print out with the best quality. It should lack of blurs and deformations etc. As you can see in the picture placed above all inscriptions should be printed in mirror view and only them not the circuit. 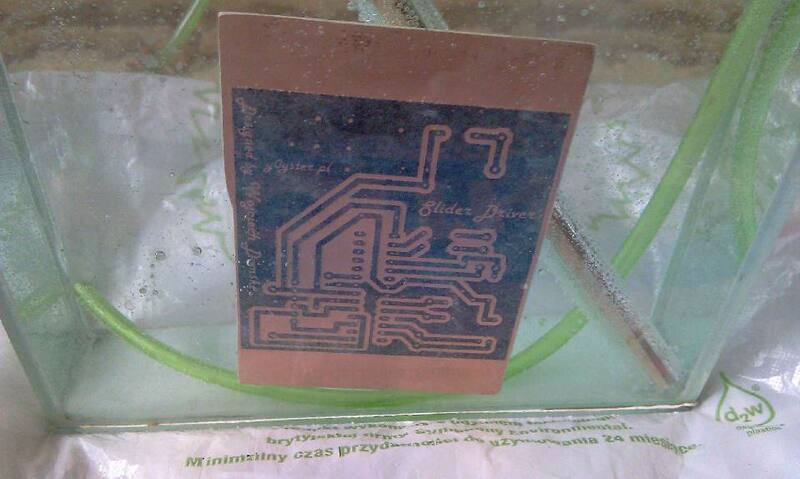 Printing the circuit without reflection only applies to the circuit placed on the bottom layer. I advise you to use some kind of graphic program to put it together. It is important that the program you are using has support for DPI resolution. It is worth mentioning that for a sheet of paper which size is A4 and DPI is set to 600 the resolution is 4500×6500. It allows you to maximize the working area. 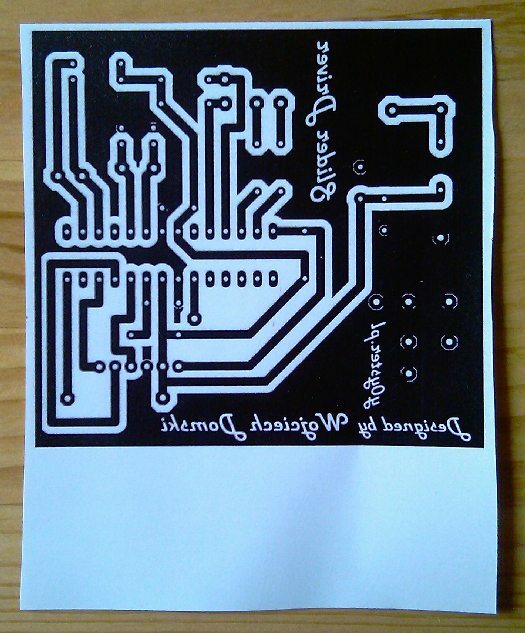 Before we start transferring the toner on to the board it is advised to prepare a container. 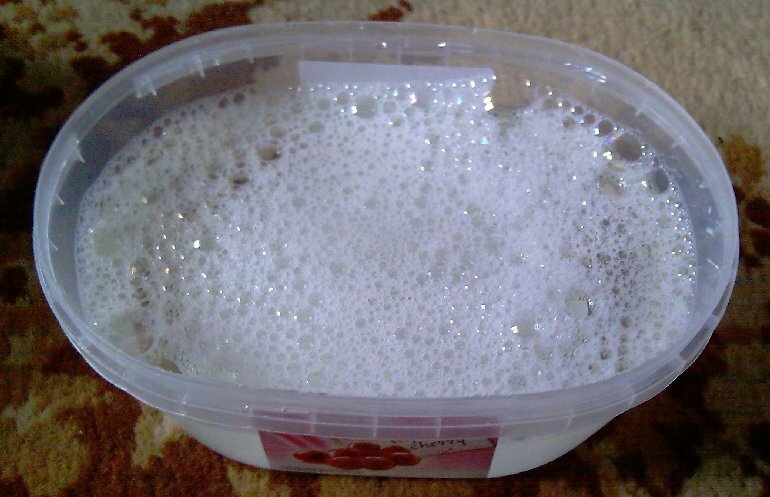 The container should be filled up with water and few drops of the dish washing liquid. You achieve the best results when the water is warm! Make sure the laminate is clean and degreased. Put the sheet of paper on the laminate. 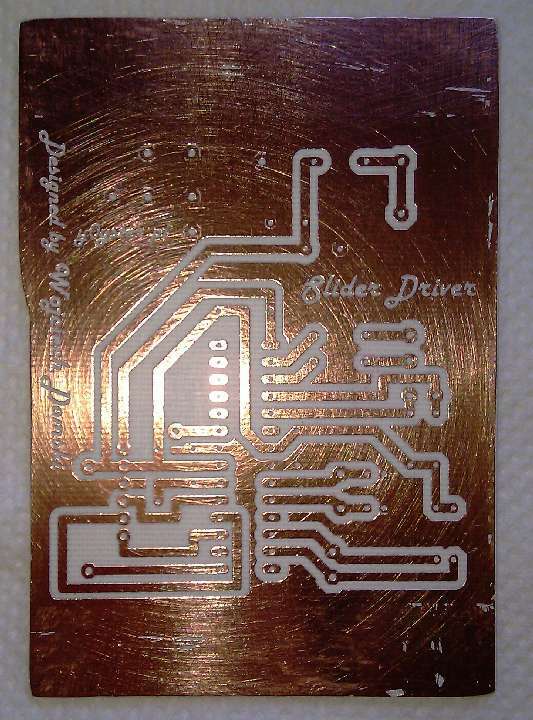 The printed side should be placed on the copper side. We set the temperature between two and three dots with the knob. 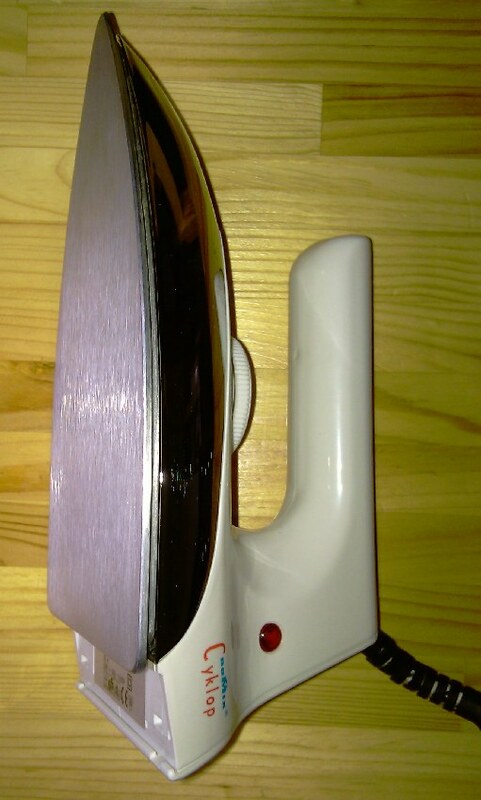 Now we set the iron in the position in which it is the most comfortable for us. For example we can place it between our knees. It is important to be careful placing the hot iron. It is very hot and you may burn yourself. You shouldn’t move the iron during the process. 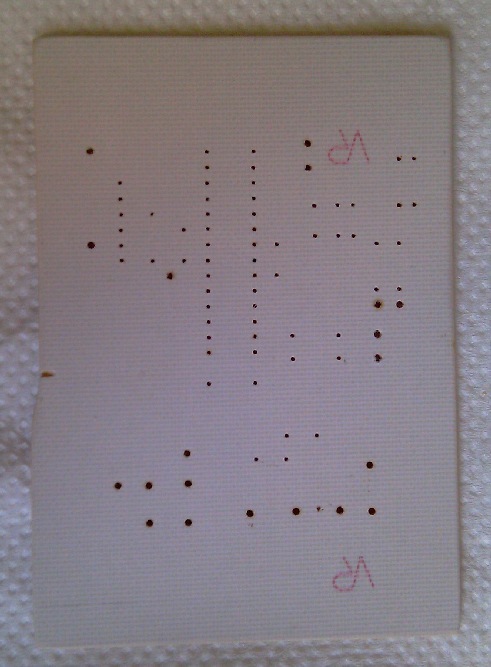 When the sheet of paper sticks to the copper then we can proceed further. 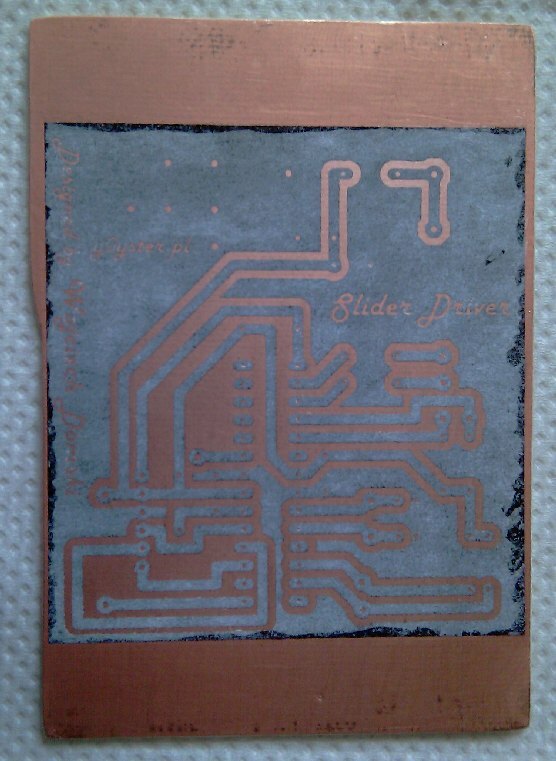 The next stage is an actual transfer of the toner to the copper. You can do this in two different ways. 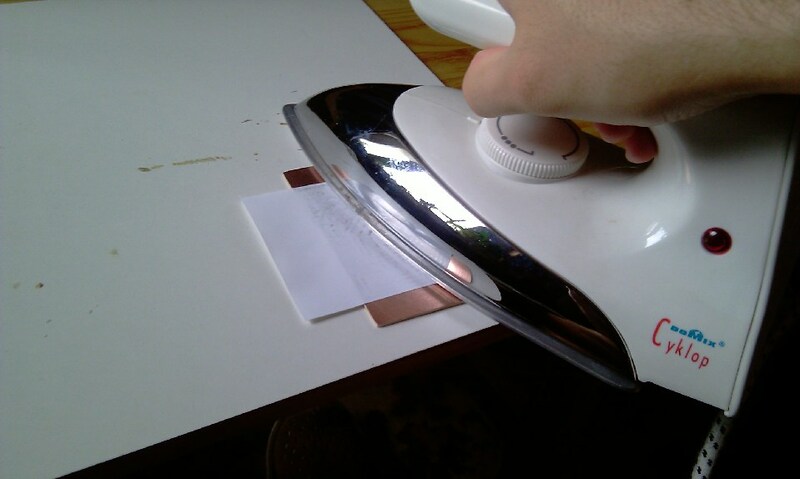 The first possibility is to press the roller against the laminate for about 5 minutes. But the preferred method is quite different and tricky. 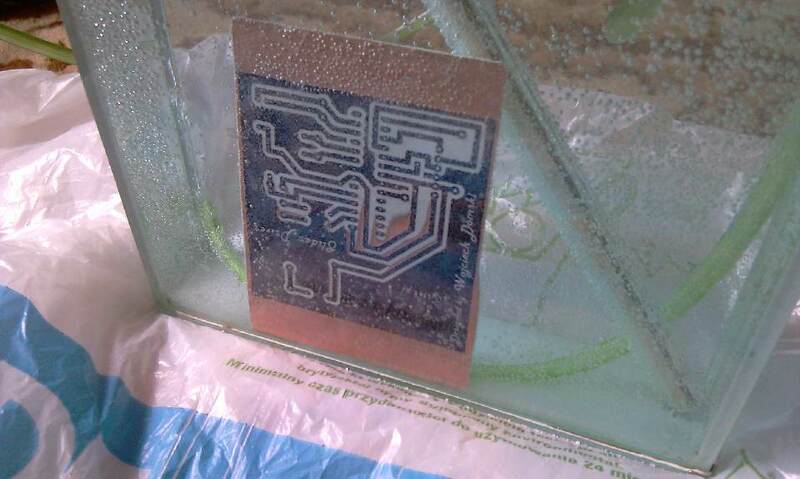 We put the PCB on the table and simply we iron it pressing the iron enough 🙂 Pay attention to the force of pressure. We are doing the ironing for about 2 minutes. Please remember to not do this too long! 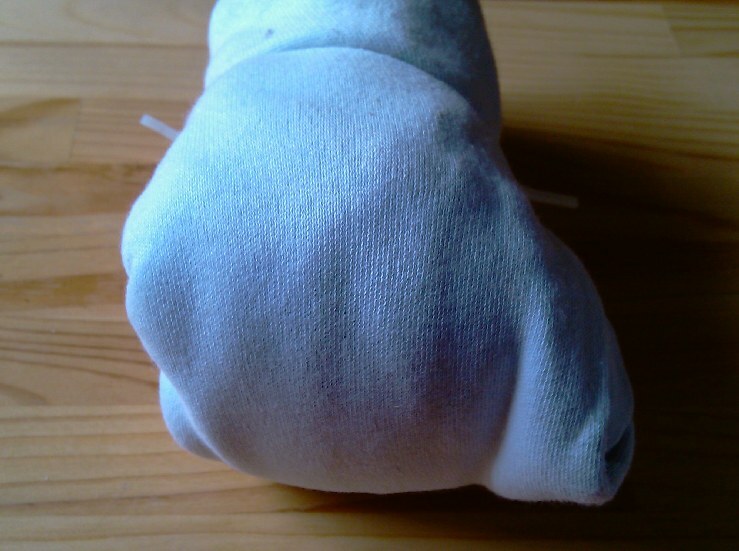 The method described above is a lot easier but as mentioned before it is a bit tricky. But it still gives good results. 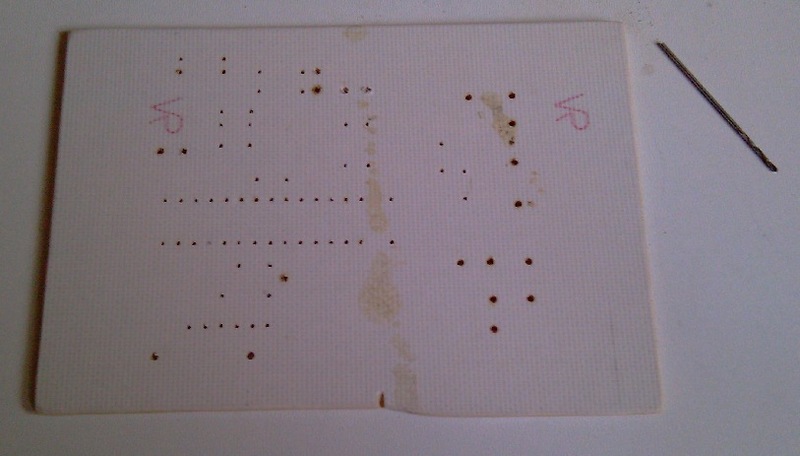 In those two methods it is worth remembering that the paper can’t move on the laminate. If it is happening there are two equally probable causes of this. First, it might be the temperature. It is simply too high or too low (unlikely). The second cause of this is the first stage of ironing. The force of pressure during using the roller wasn’t high enough. When we decide that the time when we were ironing the laminate was long enough we can proceed further. We can put the board into the container which we have prepared before. 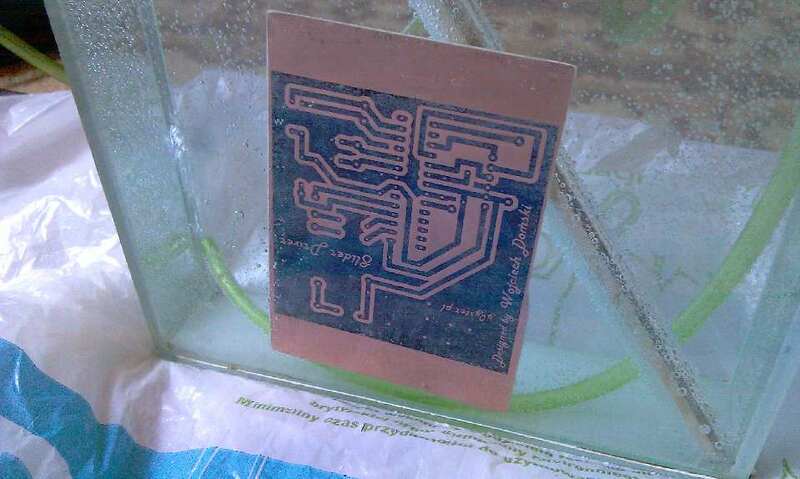 The moment when we put the laminate into the water it will make sound similar to “bzzzzz”. It’s ok because the board is quite hot and the liquid in the container is rather cold. It takes approximately 3 minutes for the paper to get completely whet after that we can remove the paper. Please do this very carefully. Nothing unpredicted like removing the toner with the paper should happen. As written above there is possibility that some of the toner can by removed with the paper. To protect the toner from getting detached you can rub the paper with your fingers. 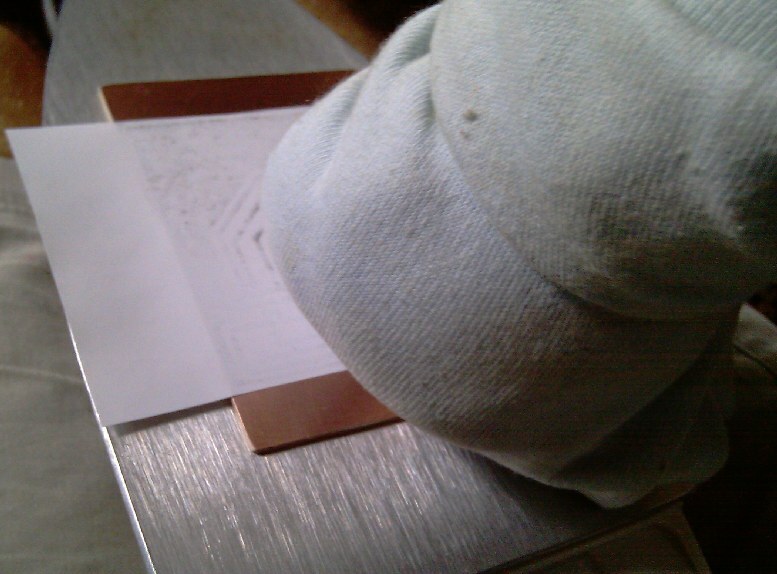 While rubbing of the paper with our fingers it will appear as small tubes of paper are beneath. 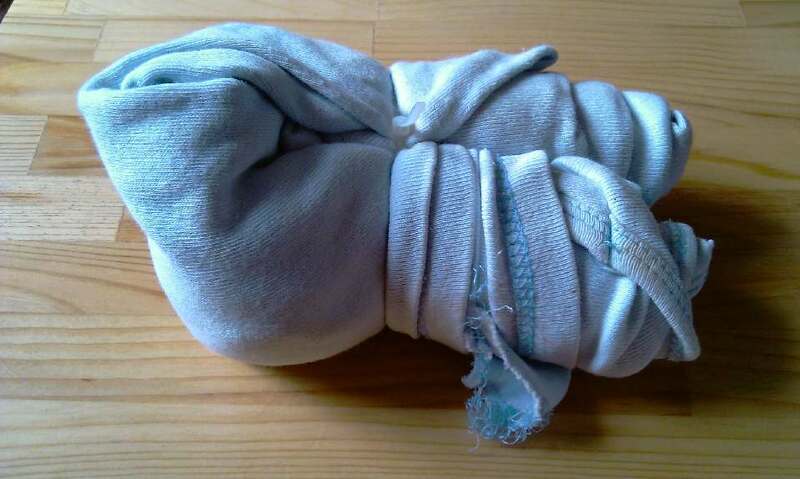 Now using a piece of paper towel we can remove excess of the water which are in form of water drops. I recommend you to be careful about this! 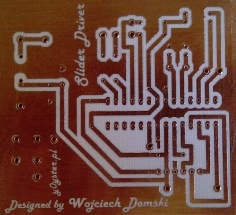 It is advised to only touch the surface of the board instead of rubbing it! Carefully put some of the nail varnish. Use just the capacity which is really needed. Don’t use too much. In some particular cases which one of them is showed below the free space was filled creating the area of ground. It is recommended to do so. 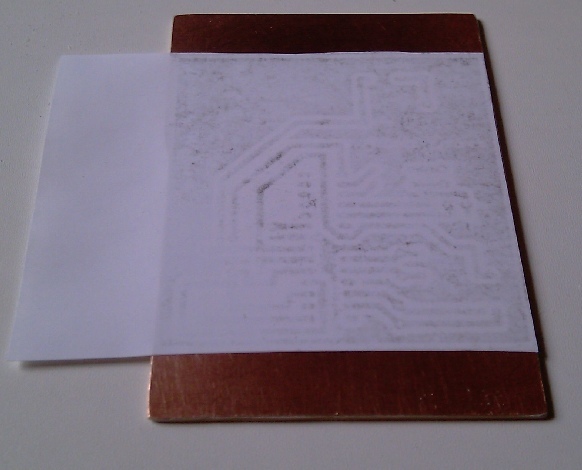 By doing this we spare the chemical substance used for etching. Furthermore, in some cases it guarantees better electrical resistance for interferences. But this is a separate subject for another discussion. Now you should wait until the nail varnish dries. It is beyond any doubt that women will do this perfectly 😉 at least I don’t have that kind of skills. When the amount of gaps exceeded your expectations then there is one way out. You have to repeat the whole process. 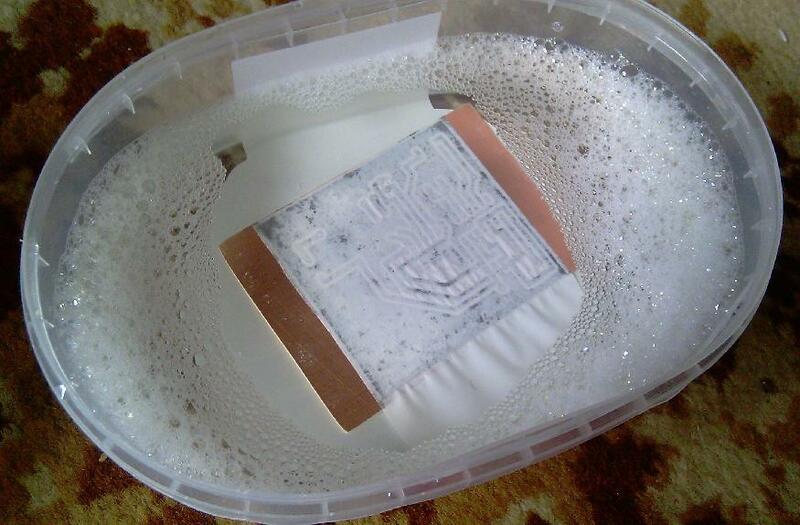 You can use the sponge made of wires to rub the toner off. 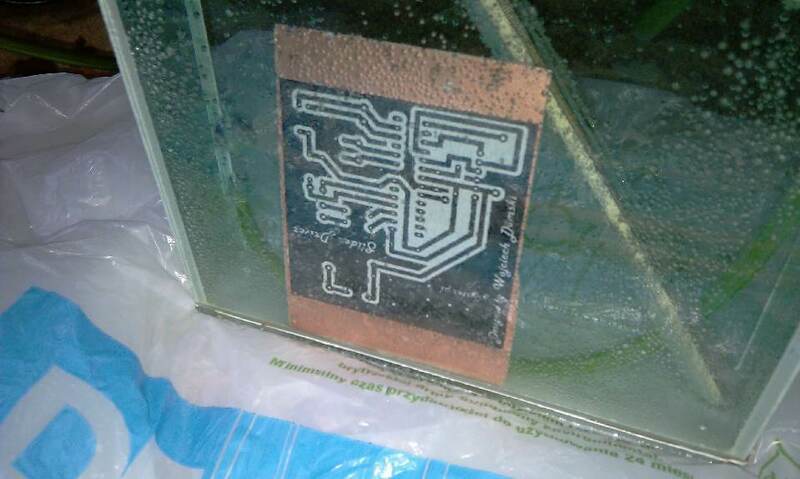 When the laminate is once again clen you can transfer the circuit one more time. 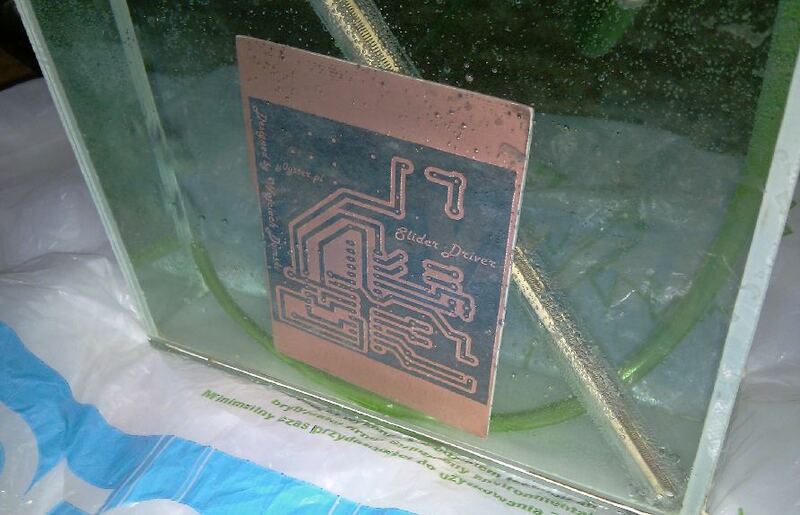 After rubbing the badly transferred toner you can notice that there is something still on the copper. It is absolutely normal and you don’t have to do anything about this. Just make sure that there is no toner on the laminate. You need a box. It can be made of glass. 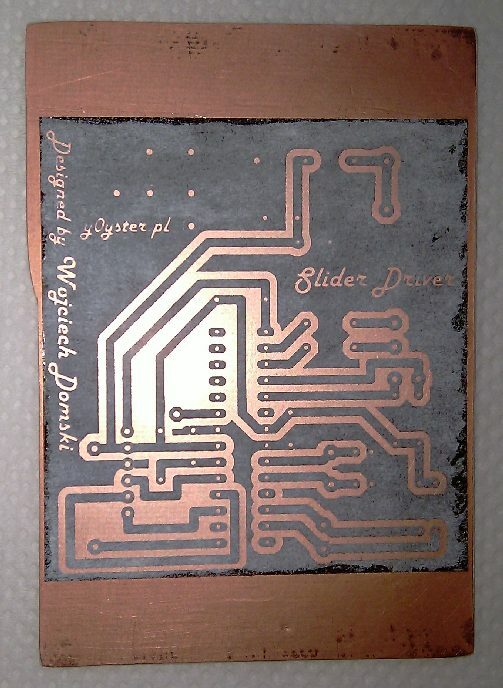 Inside the box the PCB will be etched. During the process certain chemical reactions have to take place. The copper participates in those reactions. And at the end you get copper compounds. In this case a small aquarium was used as the container. Also an immersion heater, a small pump and of course a thermometer is needed. The first step is to pour the water into the container. It can be an ordinary tap water. The next thing you need to do is plug in the immersion heater. Now, we wait until the water will reach the temperature of about 40 Celsius degrees. To accelerate the process you can warm the water outside and then pour it into the container. The next stage is to pour some of B327 to the water. It is white powder and it dissolves in water. You should use 100-250g of the B327. (The proportion is 100g of B327 on 250-500ml of water). CAUTION! DURING THE PROCESS YOU ARE ADVISED TO TAKE SPECIAL CARE!!! Now you can plug in the pump. This will cause water to circulate so the liquid will mix constantly. 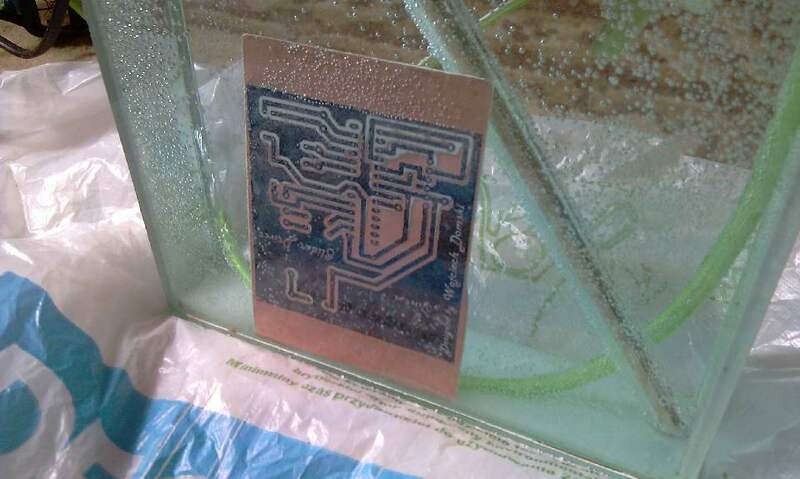 Carefully put the laminate into the solution. Be careful! It starts foaming. It is completely normal. 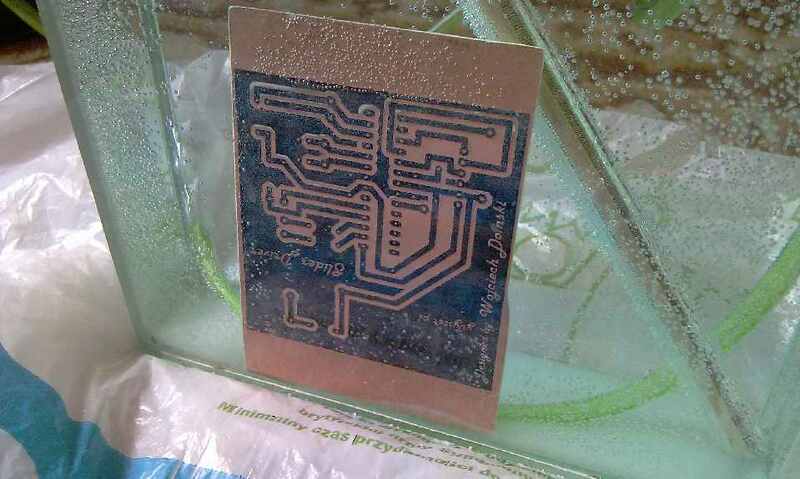 Depending on the temperature of the solution and the area the etcher has to care of the time can vary. It can be as little as 15 minutes or even more than one hour. All what you need to do is to check the situation from time to time. The temperature shouldn’t exceed the 50 Celsius degrees. Keeping it next to 44 Celsius degrees is the best. If the temperature rises above the boundaries the toner will come off. 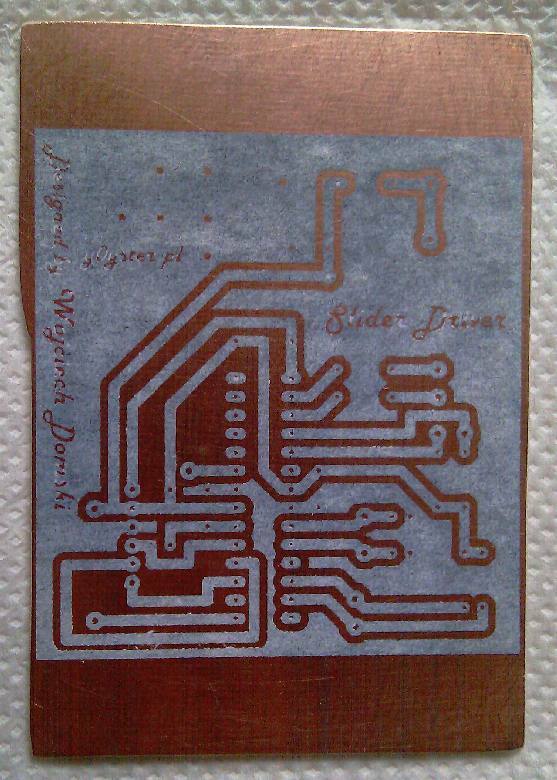 Eventually, the etcher will have free way to start eating up copper not covered with the toner or nail varnish. It is very undesirable. To remove the toner and the nail varnish you should follow the steps below. 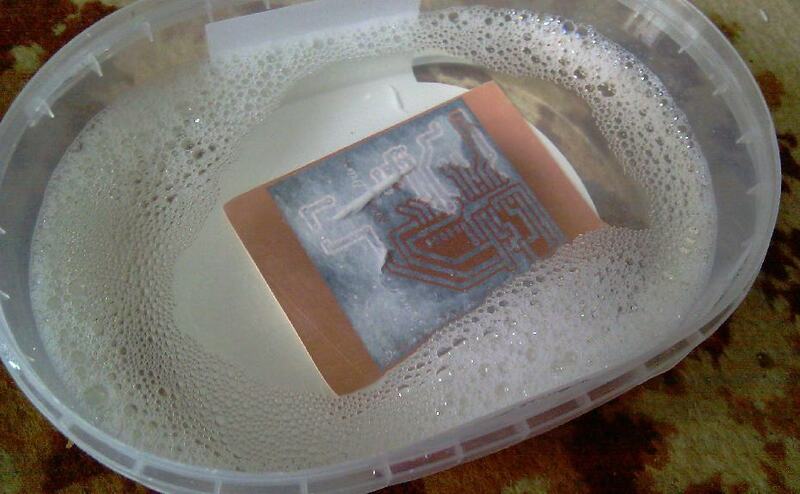 Under the running water you remove the toner using sponge made of wires. You should take special care of the areas where you put the nail varnish. It won’t come off easily. 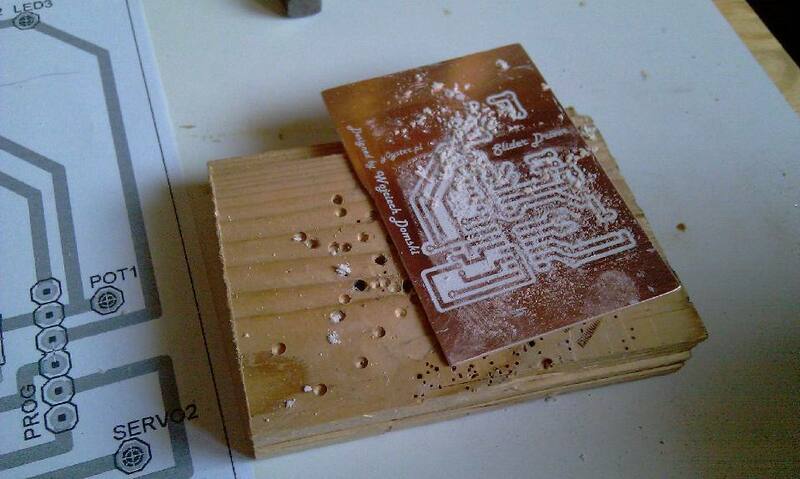 When the PCB is ready you have to drill few holes. First of all you have to mark the points where you will drill. It is not necessary but advised. The purpose of marking points is quite simple. When you start drilling the drilling bit can slide off the surface. But if there are markings the drilling bit will remain in one position. You can use the punch or the hammer and a nail. The mostly used drilling bit is of diameter equal to 0.8 mm. If you have power elements like power MOSFETs you would probably use a drilling bit with diameter equal to 1mm, 1.2mm or even bigger. One thing which I can really recommend is buying a mini driller. It is a piece of hardware which will become really handy during the drilling. Now you should wash the laminate with paint thinner or alcohol. After successfully finishing the cleaning stage you can proceed further. 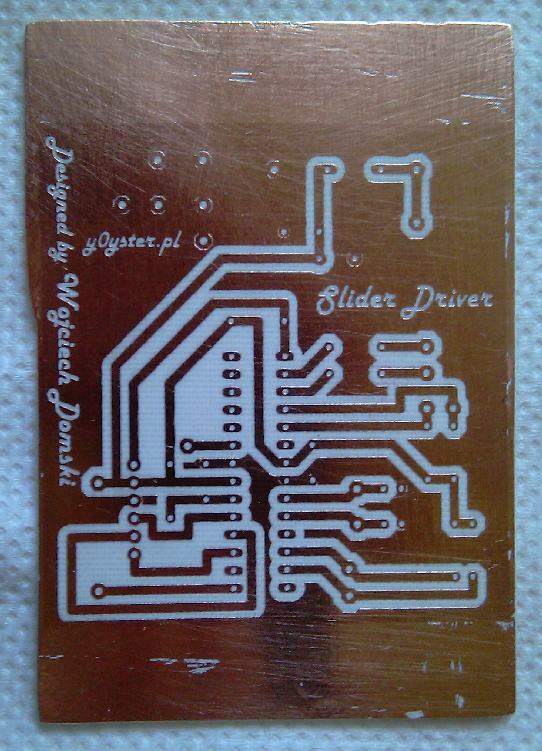 It is very simple to transfer the description of the electronic components. You should print out the description layout in mirror image but only if you put it on top layer. Like before you put the paper against the laminate. After that you start ironing it. This shouldn’t last long. About 1 to 2 minutes should be enough. With one confident move you tear the paper off. When the quality of the transferred description doesn’t satisfy you can repeat it. But before that you have to wash the laminate with paint thinner etc. The last stage and the easiest one is the impregnation. Before you start doing anything you have to prepare a certain solution. This solution is made of spirit and rosin. The best is to use crystal rosin. Just mix those two ingredients and start grinding the crystals down. The solution will become dark-brown. 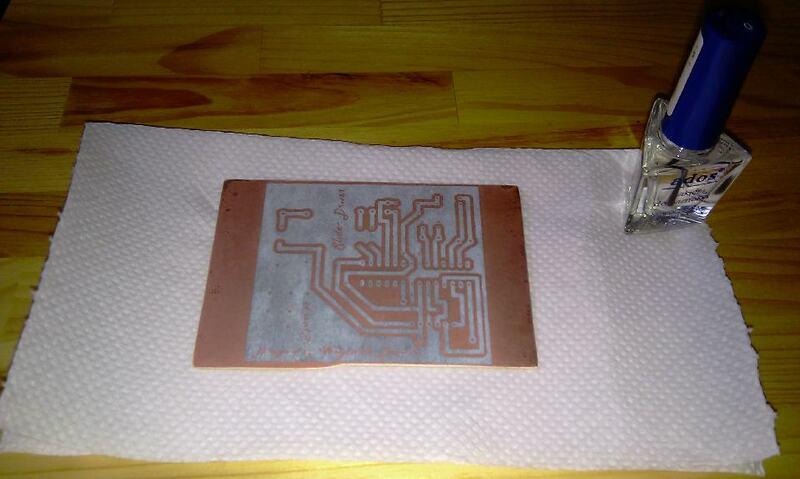 Now put some of the solution on the layer (the one with copper). It should be thinner than thicker. You can use a brush but after using one it won’t be good for anything else. 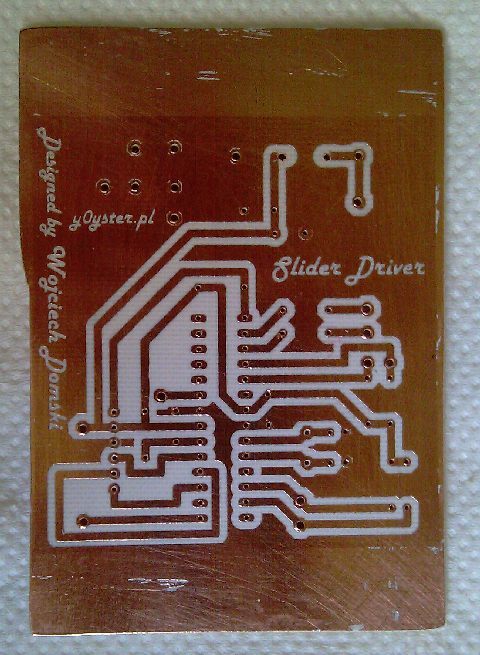 Leave the PCB to dry. 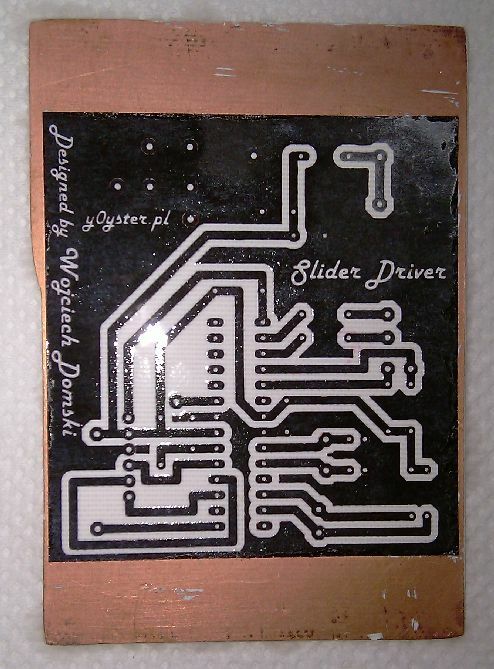 After completing all the steps you have your very own PCB.